I was reading my facebook stream today when I came across this article from the New York Times. No matter where you stand on the nickname, this is a good read. I predict, the Sioux jersey's and chants aren't going away anytime soon. I am not sure if anyone should be shocked. You don't change 80 years of tradition and history overnight. When Sandelin opened his remarks with, “Always nice to be back among the Fighting Sioux fans,” he received immediate and prolonged applause. “I knew that would get a rise,” he said, smiling. Let's just say... there are more than 4,000 Sioux jersey's. That's not going to change anytime soon. I had a few of my fellow fans tell me that they're set for life. The Dacotah Legacy Collection is one way to keep those Fighting Sioux jersey's stocked up. “When I go to that hockey game and I see 4,000 Fighting Sioux jerseys in a 12,000-seat arena, hear the chants and see the rituals and hear the booing and cheering and all that stuff, that bothers a lot of people at the university,” said the interim university president Ed Schafer, a former two-term governor and briefly the agriculture secretary under President George W. Bush. I had a conversation with someone this past weekend about the University getting the new logo right. They're convinced that the UND administration understands what is at stake. I am very skeptical. I want to clear a few things up. First, the official nickname of UND's sports team is Fighting Hawks. The writers that I know and have contact with use the nickname in their articles in one form or another. The TV channels that broadcast UND hockey use Fighting Hawks in their broadcast and in their graphics. Back in 2012, UND asked the various media entities that cover UND sports to no longer use the Fighting Sioux nickname. I've complied with their request and Fighting Sioux is no longer used in writing about UND sports. UNLESS, I am writing about a player that wore the Fighting Sioux logo. I have been told by a few readers that I shouldn't use the Fighting Hawks nickname. I disagree. I write for two syndicated blogs with thousands of readers. My managing editors would expect me to honor UND's request as well. So, I have to comply with UND's wishes. I think it's a fair request on their part. I am not trying to shove the new nickname down anyone's throat. However, it's easier to write when the team you cover has a nickname. I never, ever stopped admiring the Fighting Sioux nickname, but I have to move on. That being said, Sioux forever. Finally, I took my daughter to a game and sat in the stands, I was yelling Sioux just like everyone else. Grand Forks, N.D. -- Fans who attended North Dakota's Saturday afternoon game against Ohio State got more than their money's worth in a triple overtime game that ended allowing North Dakota an advancement to the WCHA Final Face-Off. Saturday's score was more indicative of the play between the two teams more so than North Dakota's 5-2 Friday win. After OSU's tying goal at the end of the second period. It would take another 63 minutes for North Dakota to complete the sweep and punch their ticket to play, at least, one more game at home. "It was a super grind; start to finish," head coach Brian Idalski said. The game ended 3:17 seconds into triple overtime when Becca Kohler made a transition play that sent Megan Dufault up ice. Dufault passed the puck cutting through two OSU defense to Amy Menke who put it top shelf on UND's 41st shot on goal. North Dakota will take a couple days off before they start preparing for the WCHA Final Face-Off that is being hosted at The Ralph on Saturday and Sunday. "The one thing we knew for sure we didn't want was to do was watch other teams play in our rink," Amy Menke said. Taking a page out of the UND men's hockey program's playbook, the women's team is 22-2-2 sine mid-January. North Dakota plans to take the next couple days off before preparing for face-off against the Wisconsin Badgers at 5:00 on Saturday, March 7. Tickets are available for the WCHA Final Face-Off at The Ralph box office and online. I like many NHL fans are watching this with interest. MINNEAPOLIS (AP)-- Another group of former NHL players has joined the fight for compensation for head injuries they say they incurred while playing, while at the same time targeting the violence of the game that they believe brought about those injuries. Retired players Dave Christian, Reed Larson and William Bennett filed a class action lawsuit in federal court on Tuesday alleging that the league has promoted fighting and downplayed the risk of head injuries that come from it. The lawsuit, which is similar to one brought by former football players against the NFL, joins others filed by hockey players in Washington and New York and seeks monetary damages and increased medical monitoring. The NHLPA declined to comment. This has to be one of the most asinine things that I have ever seen. Nicklas Backstrom of Sweden was banned from the gold medal game against the Canadians for failing a drug test. Must have been performance enhancing right? Nope! According to Greg Wyshynski of Puck Daddy, the banned substance in question was Zyrtec-D. In my humble opinion, that has to be one of the most moronic things I have ever seen. It makes no sense what-so-ever. How is Zyrtec-D a PED? Why is this banned? New York Times --- A Swedish Olympic Committee spokesman told The Associated Press that Backstrom, 26, had tested positive for a substance found in an allergy medication he has taken for seven years. Backstrom, a top-line center, had four assists over Sweden’s first five games. The N.H.L. and the Capitals indicated in statements that Backstrom’s doping violation would not affect his status in the N.H.L. because the substance he tested positive for is not considered a banned substance by the league. Athletes competing in the Olympics are subject to tougher antidoping rules than those of the major professional leagues like the N.H.L. Backstrom’s is the sixth known doping offense of the Sochi Games. The other athletes who failed drug tests were the cross-country skiers Johannes Duerr of Austria and Marina Lisogor of Ukraine; the men’s hockey player Vitalijs Pavlovs of Latvia; the biathlete Evi Sachenbacher-Stehle of Germany, who as a cross-country skier won two gold medals and three silver medals at previous Olympics; and the bobsledder William Frullani of Italy. Did the IOC expect him to suffer and not have him take his allergy medicine? Being a person that suffers from seasonal allergies, I would be miserable if I couldn't take my over-counter medication for my allergies. This is a rule that has to be looked at and then nuked. Someone tell me why the goal by Nick Bjugstad is goal is not a violation of the rules. • Any action by the attacking team that propels the goaltender into the goal with the puck. Also, I know Brad Shepherd is the official, but you have to watch this. How does Kyle Rau not get an elbowing penalty on this play…? Unless, I am not seeing this video right, I agree with the B.C. penalty but I think the refs missed a call again. Discussion, tell me what you think. UNO forward Zahn Raubenheimer was given a five minute major and a game misconduct for this hit on Minnesota junior forward Nick Bjugstad. I don't have a problem with the penalty being a major penalty and it's a call that the refs should be making. You can't hit a player into the board is you can see his numbers and his name tag. Can we have some F'N NHL Hockey? We just went through what seems like the longest election of our time...At least the American's did. To make things worse, the NHLPA and the NHL owners are still locked in a labor dispute and we still don't have an agreement after 52 days. Can we please get this thing settled? Lock both sides a room until they can come up with an agreement. Michael Russo, beat writer for the Star Tribune also said on tweeter today the Winter Classic is dead. Russo is one of the most in tuned beat writers for an NHL team and if he says that the Winter Classic is going to get cancelled, I will believe that it’s true as well. ANN ARBOR, Mich. (AP)--- A person familiar with the situation tells The Associated Press that the NHL has cancelled the 2013 Winter Classic at Michigan Stadium. The person spoke on condition of anonymity Friday because the league had not yet announced the cancellation of its signature event. The person also the NHL will schedule its next Winter Classic at the iconic stadium that seats more than 100,000 people. Last week, the NHL wiped out all of its previously scheduled games through the end of November. Detroit and Toronto, two of the league's Original Six teams, were going to play outdoors on Jan. 1 at the stadium known as the Big House. The league was hoping the matchup would break the world record for hockey attendance. Michigan and Michigan State's hockey teams drew a record 104,173 fans in 2010. Nice to see that the NHL is finally becoming the No Hockey League... One has to wonder if and when will the two sides finally put their differences aside and come to an agreement so we can have an NHL season. It's obvious that the NHL Owners are trying to get the NHLPA to crack and I don't see it happening this time around. I must say that I agree with the Head of the NHLPA – I also don’t see a reason to have a lock-out either. There is lots of time to get an agreement on a new CBA and in my opinion a lock-out does nothing for progressing the game of hockey after making much progress with exposure the last five seasons or so. Why not negotiate through at least the pre-season. The NHL and the NHL Players' Association can agree there's still more than enough time to reach a new labor deal even though the union has yet to submit a counteroffer with less than six weeks left before the current collective bargaining agreement expires. NHL deputy commissioner Bill Daly concurred. I am going to respond to a comment a fan made on a blog post that I wrote yesterday by someone named Bar Down, this is the comment that he posted, “Don't the players have something like a 57%-43% split??? What other sport is that uneven? I could be wrong...but if I'm right you must quit blaming the owners.” I do blame the owners – who else is culpable? The players were offered the current outrageous salaries by the owners. Do we blame Zach Parise, Ryan Suter and Shea Weber for their multiyear million dollars salaries? If the owners are willing to agree to these salaries I don’t blame the players for signing the contracts and taking the money. There is still time to work things out and not time to panic yet - this is just the beginning of the negotiations. The regular season doesn't start until October 11, 2012. NEW YORK (AP) -- The NHL and the NHL Players' Association are set to resume labor talks on Wednesday at the league offices in New York. Total revenue of the league's operations is the biggest sticking point right now, and it's an important one. The players like their cut right now. The owners don't. The two sides met last Friday in another round of negotiations for a new collective bargaining agreement before the current one expires on Sept. 15. There were multiple reports coming out of the last round of talks that the owners' offer included players' hockey-related revenues get slashed from 57 percent to 46 percent. It also was reported that players would be forced to wait 10 years before becoming unrestricted free agents and that contracts would be limited to five years -- a major change considering Zach Parise and fellow blue-chip free agent Ryan Suter decided to sign matching 13-year, $98 million contracts with the Minnesota Wild. NHLPA executive director Donald Fehr and NHL deputy commissioner Bill Daly are among those meeting Wednesday. The two sides have regularly met since opening talks June 29 in a bid to reach a new collective bargaining agreement. This letter by Joe Paterno's which was written in December of 2011 or January of 2012 has been making it's way around the internet today and its a must read if you have not read it. Yet, over and over again, I have heard Penn State officials decrying the influence of football and have heard such ignorant comments like Penn State will no longer be a ''football factory'' and we are going to ''start'' focusing on integrity in athletics. These statements are simply unsupported by the five decades of evidence to the contrary - and succeed only in unfairly besmirching both a great university and the players and alumni of the football program who have given of themselves to help make it great. For over 40 years young men have come to Penn State with the idea that they were going to do something different - they were coming to a place where they would be expected to compete at the highest levels of college football and challenged to get a degree. And they succeeded - during the last 45 years NO ONE has won more games while graduating more players. The men who made that commitment and who gave of themselves to help build the national reputation of what was once a regional school deserve better than to have their hard work and sacrifice dismissed as part of a ''football factory,'' all in the interests of expediency. Penn Staters across the globe should feel no shame in saying ''We are . Penn State.'' This is a great university with one of the best academic performing football programs in major college athletics. Those are facts - and nothing that has been alleged changes them. Looks like Ryan Suter ‘s agent Neil Sheehy has seen and heard enough – Neil does have a point – if we were in the same situation we wouldn’t be rushing through these decisions. 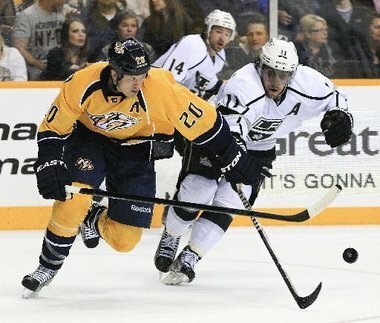 NHL.COM --- Ryan Suter and Zach Parise are in Day 3 of NHL free agency with some wondering why they haven't made a decision on where to play. Suter's agent, Neil Sheehy, has heard enough. He tells The Associated Press: "When a young man is asked to commit for 13 years, why is it considered extraordinary to take a few days to make a decision?. A deal will happen when it happens." Parise told reporters on Monday that he was getting closer to a decision, saying he hadn't set deadlines. The two free agents are both 27. Former UND recruit Miles Koules was on the Pipeline show with Guy Flaming and Dean Milard; Koules discussed his decision to join the Medicine Hat Tigers instead of playing the University of North Dakota Fighting Sioux next year. Miles Koules was asked about why he changed his mind and this is what he had to say. "You know what, North Dakota was a great place, the facilities and everything were awesome," Koules said. "The main thing that I looked at was; A - the amount of games, I just think that the amount of games that you get to play in the WHL really helps turn you into a pro more than college." "I think I play a bigger role on the Tigers next year than I would at North Dakota my freshman year, that was pretty much a deciding factor as well." This news came out today and SDSU won't play UND until UND "is in good standing" with the NCAA and no longer on sanctions. ﻿﻿FARGO, N.D. (AP) — The leader of University of North Dakota's alumni says South Dakota State has joined a growing number of schools that won't schedule UND in athletics until the controversy over its Fighting Sioux nickname is resolved. UND Alumni Association and Foundation CEO Tim O'Keefe was in Fargo on Tuesday morning to kick off a campaign to get rid of the nickname. O'Keefe says the issue is no longer about preference, but the price the school will pay if it keeps the moniker. O'Keefe says SDSU won't schedule any more athletic contests with UND until the Grand Forks school is "in good standing." SDSU officials were not immediately available for comment. In my opinion I think that the Miami players got off easy and I would've liked to have seen stiffer penalties levied by the NCAA for the Miami Hurricane Football program. This basically a slap on the wrist. I guess after the OSU scandal we can't expect too much from the NCAA. Eight Miami (Fla.) football student-athletes must miss competition and repay benefits as a condition of becoming eligible to play again, according to a decision Tuesday by the NCAA student-athlete reinstatement staff. The student-athletes received varying levels of recruiting inducements and extra benefits from university booster Nevin Shapiro and athletics personnel, according to the facts of the case. Reinstatement decisions are independent of the NCAA enforcement process and typically are made once the facts of the student-athlete’s involvement are determined. This is typically well in advance of infractions decisions. The enforcement investigation into the university's football program is ongoing. 1)Here is a good site that you might want to visit if you want to kill some free time play bingo games online. 2) There are hundreds of on line casino sites, but only one has been named the best usa casino.